Ghian Foreman was one of many South Siders willing to give up parkland for the library if it meant more jobs and educational opportunities for the neighborhood. HYDE PARK — For the second day in a row, South Siders crammed into overflowing rooms Wednesday in support of the Barack Obama Presidential Library coming to Chicago. Close to 1,000 people crowded into the Washington Park field house, 5531 S. Martin Luther King Drive, with Chicago Park District staff opening multiple rooms to accommodate the crowds. Again, there was overwhelming support for putting the library in Chicago, especially on the South Side. “It would be a slap in the face if any city other than the city of Chicago gets this endorsement,” said Torrey Barrett, director of the KLEO Community Life Center in the Washington Park neighborhood. Residents of Washington Park said they were willing to give up a portion of Jackson or Washington parks to accommodate the university's proposal for the library if it could bring jobs and educational opportunities for young people. “I was concerned yesterday that more people were concerned about our parks than our children,” said Renee Stevas, a Washington Park resident. Some speakers expressed worry Wednesday that development of the library could spark a real estate boom in the neighborhood so powerful that current residents would be priced out. “Look around you, this area is being gentrified,” said Bobby Townsend, another Washington Park resident. 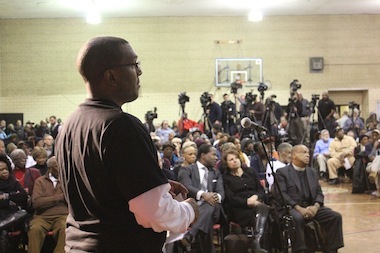 The Wednesday hearing was not as rowdy as a Tuesday meeting at Hyde Park Academy High School, 6220 S. Stony Island Ave. Speakers calling for the library to be built on vacant property in the neighborhood or expressing concern about the University of Chicago's secretive process for selecting sites got the biggest reaction from the crowd. “The university and the city did not select these sites to be finalists, the Obama Foundation did,” said Derek Douglas, vice president of civic engagement at the university, referring to the nonprofit in charge of recommending a site to the president. Discussion has largely centered on the university’s proposal to use 22 acres of Washington Park and 10 acres of property that the U. of C., city and CTA own next to the park. Parks advocates continued to ask the university to back off on using parkland and to encourage the Obama Foundation to build on 10 acres of private property offered up by the university — land the size that Friends of the Parks and other groups said is equivalent to the John F. Kennedy library in Boston. At this point, the Park District Board does not have an official proposal for either giving up or swapping park space.